As you can see the plumbing is roughed in. I'll start on the wiring this week and post pictures then. I am so excited to find your blog!! I also live in North Texas (Canton) and am building a container house. 1) what kind of foam insulation did you use? I assume it was sprayed (or will be sprayed) between the inside studs. 2) From your plumbing pictures it looks like you used flex tubing instead of PVC. Is this correct? And if so, was the flex more cost efficient? Thanks so much for any answers you can provide. We have the inner walls removed, stud walls in place, and windows and door in. A lot of the wiring has been done, but there's still a lot to go on that. Need to start roughing in the plumbing soon! I'd appreciate keeping in touch, especially since we live in the same part of the country. Thanks again for your blog! Thanks. I do plan to use the spray foam. I hope to find out how it works in a couple of weeks. 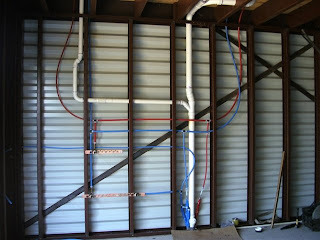 The plumbing lines are called PEX. It is common to use it over rigid pvc. It avoids all the glue joints and has less chance of leaks. The higher price of the materials is offset by less labor time. Thanks for your response. Have you given any thought to how you will insulate the outer walls? Ceramic paint? We intend to have our container home look like a traditional home, with hip roof and siding. So the ceramic paint would be pointless for us. We're torn as to 1) whether we need to insulate or not under the siding, and 2) what we should use. Any thoughts on that? I looked at the ceramic paint. It is such a thin barrier to block the transfer of heat that I decided it wasn't worth the trouble. What you use to insulate depends on how you plan on attaching the siding. It is common to install rigid foam on the walls before the siding in conventional construction. But you'll still need to use another insulation to get at least an R-14. You should be able to use spray foam between the stringers that your siding is attached to and get more than R-14. 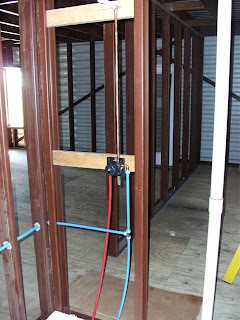 And if you are attaching sheetrock to studs on the inside you could use another insulation to increase the R value. Batt is still the cheapest way to insulate. But I would stick to spray foam and/or rigid foam. I still plan on insulating the garage/apartment in another week or two. When are you starting a blog on your house? I would like to see how it turns out. I'm a techno-cretin and have no idea how to do a blog.Wish I did, b/c I'd like to share what I'm doing. P.S. I do have photos,taken as we go along, if you have an email address I could send them to. Where in North Texas are you? You're certainly welcome to visit!